Many software downloads come with a signature file. You normally need to download this signature file separately. Signatures are a great way to let people know that you are the person / company that is making the software available, and that no one else has changed the data since its release. We are going to use Tails Linux as an example. On their download page, you will find a link to download the Tails ISO image. This is the data we are interested in running. Think of it like the main program that we want to install / use. Next, we are given a link to the "Tails 1.4 signature". This is signature file that the distributor created. With this signature we can verify that the Tails ISO Image has not been modified by anyone else. 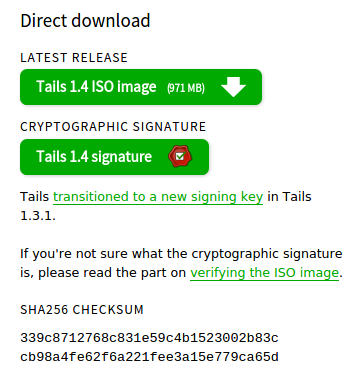 Tails also provides a "SHA256 Checksum". This is a less-rigorous way than signatures to verify the data has not changed. First, download the ISO file AND the signature file. The signature file will almost always end with ".sig". Make sure both files are in the same directory. In this case, we also need to get the public key of the person that created the signature. From the tails website, I find the ID of their signing key, so now we need to import. Here we can see when the signature was made, and the ID of that key. Next we see "Good signature" which means that the signature does verify the data. Now can can compare this hash value to the one on the website, and we see that they are the same. If I can just check the hash value, why verify with a signature? Hash values do allow you to make sure that the data has not changed, however, there are a number of weaknesses. For example, someone intercepting your network traffic could deliver the web page to you with an altered ISO link AND an altered hash value on the page. This means that the hash value will be valid, but the source of the information cannot be trusted. Signatures help this in a number of ways. Because the signature is generated by a developer's private key, and we are verifying it with their public key, it is nearly impossible for someone to pretend to be the developer. Also, since we did not download the public key from the webpage, but looked it up on a different server, it is slightly more difficult for someone to trick us into download the wrong key. Further, we can try to use the Web of Trust to make sure we are getting the right key. In our case, we can see who has signed this key by going to a keyserver checking.